The fight against corruption is one of the key campaign issues for the Latvian parliamentary elections on 6 October. However, the strange cabals, which are likely driven by Russia, tend to tarnish the entire political class. EURACTIV France reports. “Even the polls are corrupt here!” In a building in the old city of Riga, Juta Strīķe, a former official at the anti-corruption bureau and candidate in the October parliamentary elections, proudly showed off the party offices of the New Conservative Party, founded by the former justice minister Jānis Bordāns. The latest estimates assign only 4% to his party. “We are downgraded in the polls because there is the minimal threshold of 5% to be elected, so voters tend not to choose parties that are below that level,” Strīķe explained. At the Latvian municipal elections, the party, which made fighting corruption its main issue, secured three times as many votes as had been anticipated. The New Conservative Party works hard to defend the traditional Latvian identity and its candidates proudly display photos of themselves dressed in folk clothes. Early in July, Latvia’s first independence, declared in 1918, was the subject of drawn-out celebrations. There were 43,000 participants from hundreds of choirs who paraded singing through the town, wearing green crowns. This is a way of drawing a line under the Russian occupation, which plunged the country under a rule some Latvians equated with hell until 1989. The traditional songs played a major role in the country’s insurrection against the Russian occupation. 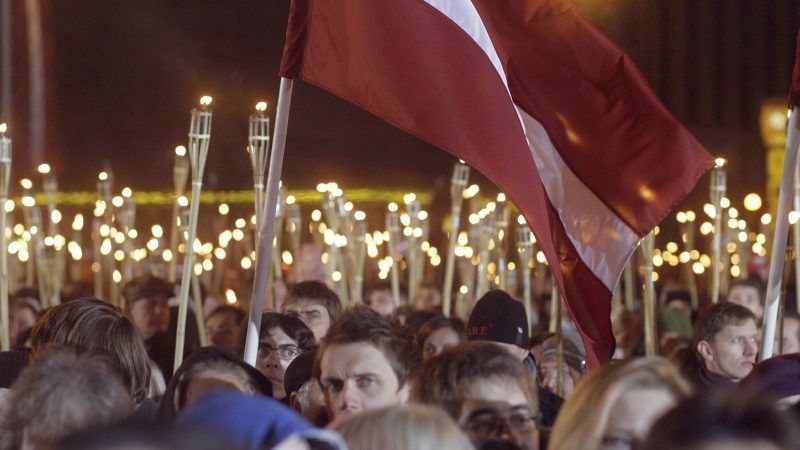 The country remains torn between a population that is 40% Russian speaking and of Russian origin, the Latvian identity and a strong attraction to the Anglo-Saxon countries and American-style liberalism. It is difficult to discern any sign of belonging to the EU in this eurozone country, but for the currency. On the other hand, the influence of America is omnipresent, from enormous SUVs to the eternal hamburgers, as well as the brain drain: young Latvians are leaving in order to study in the United Kingdom, Germany or Austria and often do not return. Europe is rarely the subject of debates. At the last European elections, only 30% of voters participated, in other words, half the figure for the national elections. The New Conservative Party recruited two former employees of KNAB, the anti-corruption bureau, who were fired for having gone a little too far in their investigations. Strīķe assured that there was no reason for the central bank governor’s case, which was a simple matter, to stay on the shelf for five years. “We had everything in 2013. However, nobody wants to touch the sensitive files or those concerning Russian interests. The justice system doesn’t want anything to do with it,” she summarised. According to the party leader, former judge Jānis Bordāns, “Riga is still the money laundering capital of Europe. We have to take draconian measures to change this”. In particular, the party would like to replace Pēters Putniņš, the chairman of the financial regulatory authority, the FCMC. The New Conservative Party is one of 16 parties running in the Latvian elections. The election looks complicated because there are a few entirely new parties, some more traditional heavyweights, such as the centre-left party Harmony, which is close to Russia, and another well-established party formed in a rather unexpected alliance: the Union of Greens and Farmers. As often happens, the campaign has been riddled with wild accusations, which have not necessarily been well documented. “The print media is talking nonsense. It’s not complicated, the public radio, which is pretty serious, doesn’t even do a press review any more,” summarised Iveta Kažoka, director of the think tank Providus based in Riga. Kažoka considers that Russian interests often tend to “tarnish the entire Latvian political class”. Accordingly, the Finance Minister Dana Reizniece-Ozola has been accused by the only financial newspaper of managing the bankruptcy of the ABLV bank at the expense of Russian interests and is regularly caricatured as being linked to the mafia. The vice president of the European Commission, Valdis Dombrovskis, had already borne the brunt of a violent cabal on his appointment to the Commission: some of the media accused him of being offered a trip by private interests. This was a way of tarnishing not only his party but also Europe. This is a context in which the reprimands about the soundness of the financial system, pouring in from everywhere, are not a priority. In late July, the European Commission gave Latvia two months to transcribe the Fourth Anti-Money Laundering Directive, while the fifth directive had just been adopted by the European Parliament. In addition to imposing a significant reduction in the total assets held by foreign residents in Latvian banks, the government was pleased to have passed a law which limits the possibility of establishing shell companies in the country. However, as the assistant secretary of the American treasury, Marshall Billingslea, noted, around 20 urgent reforms remain to be passed. This represents a challenge for the inevitable coalition government that will emerge from the October elections.